Welcome to The Quilters Guild of Ireland website. We are a non-profit group providing education about patchwork and quilting. The majority of our members reside on the island of Ireland but, we also welcome international members interested in learning about the art and craft of quilting, regardless of their nationality, background, creed, gender, or age, hair colour, weight, or shoe size. Our mission is to reach out equally to the lone quilter in Ireland, and to those already in quilt groups. We don’t hold monthly meetings, though there are many groups which offer regular meetups. Check out our page Quilting Groups in Ireland. Every March/April we organise a big retreat in a location as central as possible for everyone on the island of Ireland. Previously, we organised alternative venues North and South, but recently it has been settled in the vicinity of Dublin, making sense transport wise. This annual retreat/conference is a much treasured weekend, where new friendships are made, and older ones renewed. Whether you attend on your own or with your quilting friends, you are sure to leave inspired by members work, the teachers and the workshops. 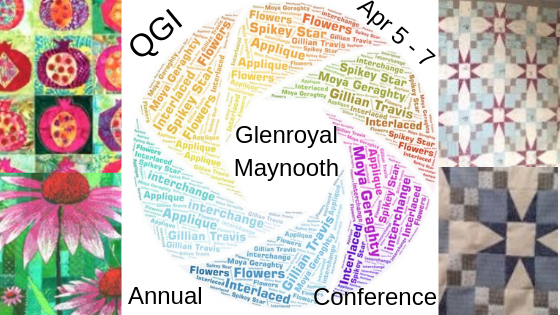 From 2018 members will receive a newsletter three times a year, and can take part in various QGI activities to be held throughout the island of Ireland. We hope you join us. Southernmost point: Brow Head (near Mizen Head), County Cork, Republic of Ireland (Latitude: 51° 26′ 52″ N). Not forgetting Fastnet Rock, which lies in the Atlantic Ocean 11.3 km south of mainland county Cork. It lies at latitude 51.37ºN. Not forgetting Inishtrahull Island, situated in the Atlantic Ocean 7 km north of Inishowen Peninsula, county Donegal. It lies at latitude 55.43ºN. Did you know that at longitude 10° 39.7′ Tearaght is the westernmost of the Blasket Islands, and thus the westernmost island of Ireland? It is also one of the westernmost points in Europe after Iceland. Easternmost point: Burr Point, Ards Peninsula, county Down at longitude 5.43ºW. It is situated 2 km southeast of the village of Ballyhalbert.